PESHAWAR: Despite the Khyber Pakhtunkhwa government’s orders to ban the plastic bags, shoppers remain wedded to it while the plastic waste still litters the streets of the cities. The numbers are staggering and they are everywhere. They clog the city’s dilapidated drainage system. They fill the irrigation canals. In many locations, the city is spoiled by the ever-spreading piles of trash — most of it, plastic. Plastic bags are cheap to produce, easy to carry and store that’s why they have captured almost 100 per cent of KP markets. Since the previous the PTIs’ previous government, occasional orders are being issued for its ban and attempted to introduce biodegradable plastic bags, however, the orders could not be implemented due to its vast use and lack of available alternatives. Recently, once again the Chief Minister KP Mehmood Khan ordered a complete ban on the use of plastic bags and constituted a committee to devise its alternative, however, there is little hope attached to the new abrupt order as well. To Dr Hizbullah, Chairman Department of Environmental Sciences, University of Peshawar, the decision to ban non-biodegradable plastic bags should not be done abruptly and for proper implementation, the concerned stakeholders – manufacturers, shopkeeper and consumers – should be taken in confidence before slapping any ban on its use. “Developed countries discourage the use of plastic bags by imposing extra charges on it,” remarked Dr Hizbullah. “The extra charges on the use of plastic bags have helped in its minimal consumption as consumers prefer to use their own cloth made bags for shopping.” He added that the addition of enzymes which helps the degradation of plastic bags makes it expensive. These enzymes help the Plastic bags to convert in carbon dioxide and water when reached to the soil. According to Environmental Protection Agency, plastic bags are hazardous for human health, as the burning of the plastic bags produce toxic chemicals such as Dioxin and Furans, when inhaled by humans can result into serious diseases including cancer. Similarly, plastic bags have a negative impact on the environment too; sewerage blocked by plastic may result in the breeding of mosquitoes, and can lead to disease like cholera, Hepatitis B and typhoid. In the densely populated Nothia Bazaar, Ayaz Khan sells plastic bags from last one decade to him banning of plastic bags is not a solution to the problem, as its use is almost impossible. “In today’s world everything is packed in plastic bags from Shampoo bottles to edibles, how the government will provide a substitute for it”, says Khan “The ban will further worsen the situation not only for the shopkeepers but for the commuters too.” To Ayaz previously with government intervention, some of the vendors tried to adopt biodegradable plastic bags but it leaves a pungent odour in their edibles, therefore most of the shopkeepers now avoid it moreover, biodegradable bags are of low quality and much expensive for consumers. The WSSP daily dispose of 850 tons of solid waste from Peshawar city, says Hasan Ali Adding that plastic takes hundreds of years to degrade, therefore without banning, the issue has no other solution. “Although in terms of weight the ratio of plastic bags in the solid waste is low,” says Ali “However, if it is even one ton in the solid waste its volumes matters. To Hassan, WSSP is also working on community sensitisation related to use of plastic bags. After the ban, the violators will be charged with a fine. In KP, a committee formed under the chairmanship of Shaukat Yousafzai in 2016, recommended a complete ban on non-biodegradable plastic bags, however, due to the reservation of local traders, and manufacturers the timeline was later on extended. However, the former chairman of the environment committee, and current Information Minister, Shaukat Yousafzai, now finally announced government decision to impose a complete ban on non-biodegradable plastic bags. 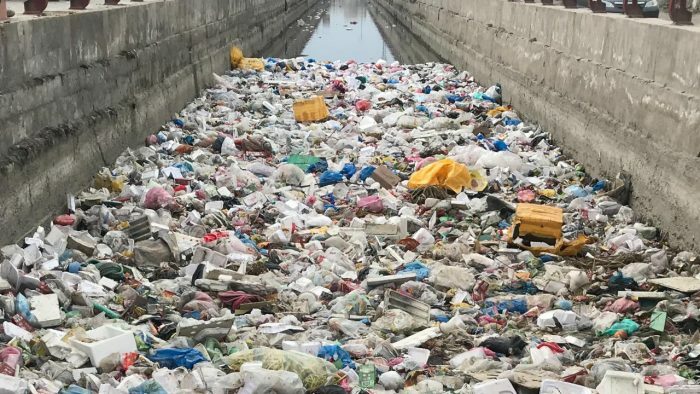 “The provincial government directed all the deputy commissioners to impose section 144 on the use of non-biodegradable plastic bags,” says Yousafzai “in case of violation the responsible will be punished with a fine from 50,000 to 50,00,000 rupees, while in case of further non-cooperation it can lead to two years of imprisonment”. 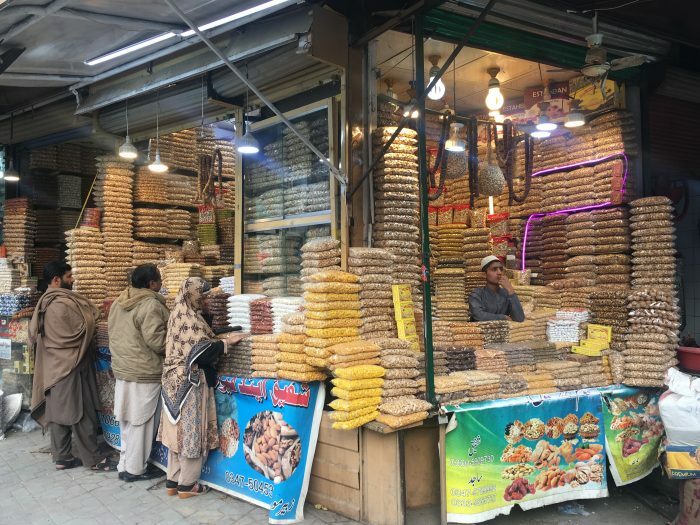 Yousafzai says that, although the ban is currently limited to plastic bags, however, in the second phase of the drive, the crackdown will be extended to other plastic products. In spite of the ban, the KP government and plastic bags manufacturer are still not on one page. Naseem Gul, President Plastic Bags Manufacturing Association KP consider existing plastic bags completely harmless. “Our plastic bags are more environmentally friendly than government’s suggested biodegradable,” says Gul, “These plastic bags have no health hazard, and completely harmless as it can be recycled,” Gul claimed that biodegradable plastic bags are more hazardous for health, adding that, the government cannot ban their plastic just because a small portion of it results in the blockade of sewerage. To Gul, if the government did not change its stance they will chalk out their future strategy. 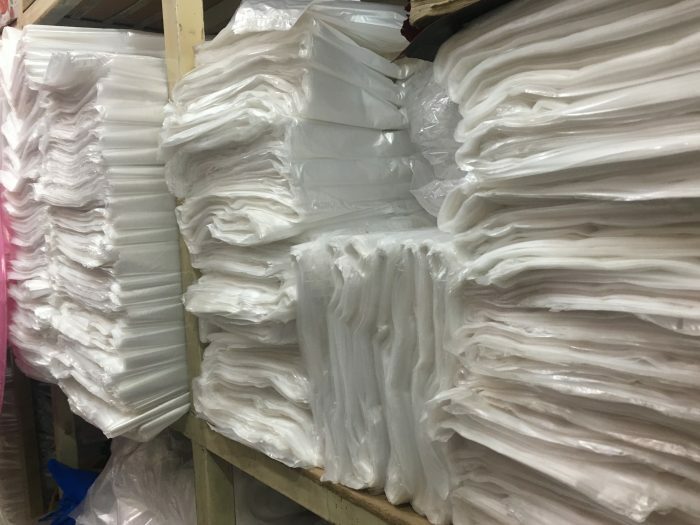 However, Director General Environmental Protection Agency, Dr Bashir Khan claims that the plastic bag’s manufacturers were taken into confidence earlier before drafting the law, however, when the ban was imposed the manufacturer backed out. Dr Bashir, on noncompliance they prosecuted plastic manufacturer and stores and their cases submitted in the Environmental Protection Tribunal. Formed under Environment Protection Act 2014, Environmental Protection Tribunal has so far received around 80 cases against plastic bags manufacturers and stores in the province, most of the cases submitted against stores and manufacture in Peshawar, followed by DI Khan, Lakhi Marwat and Bannu. 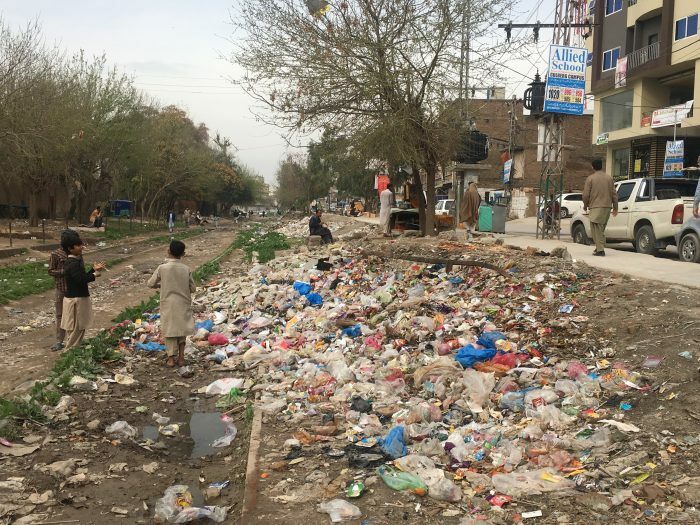 District Nazim Peshawar, Muhammad Asim said that to educate people of the harm the plastic bag can cause the district government is planning to trigger up campaigns in the city. Adding that, they are in talks with plastic bag manufacturers to convince them to shift their units towards biodegradable plastic technology. Afsar Khan, Deputy Director of Climate Change Cell, believes that the introduction of biodegradable plastic bags in KP will initiate a reversible reaction process, putting an end to the growing waste of plastic bags. To Khan, burning of plastic gases not only produce greenhouse gases, but it also affects agriculture productivity by blocking seeds germination. To him, there is no country in the world, where the ban has resulted in a 100 per cent solution of the problem; however, a ban is the first step towards providing a healthy and unpolluted environment to the commuters. Khan added that with all these steps community also needs to act responsibly and put plastic waste in containers instead of throwing into the streets.